An artist's rendering shows the Optical Payload for Lasercomm Science (OPALS). 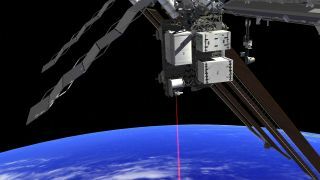 The slow process of capturing science data is about to go into serious overdrive with a NASA laser communication experiment set to launch to the International Space Station. The Optical Payload for Lasercomm Science (OPALS) — which will be sent up to the space station aboard SpaceX's cargo-carrying Dragon capsule Sunday (March 16) — will test a substantial upgrade to the data streaming process by sending information via laser beam rather than radio wave. Information sent by optical communications, also known as lasercomm, will reach scientists faster than data sent by conventional radio transmission. This is an important step as improving scientific instruments generate measurements in greater detail, but taking up significantly larger memory sizes. Successful tests of the technology, like OPALS, will help pave the way toward operational optical communications in NASA's planetary and deep space missions, enhancing connections to engineers and scientists as well as to the public. "Our ability to generate data has greatly outpaced our ability to downlink it," OPALS project systems engineer Bogdan Oaida said. OPALS could help to change that problem. The Optical Payload for Lasercomm Science (OPALS) instrument is hoisted onto a shipping pallet for transfer to Kennedy Space Center in Florida. From there it will launch to the International Space Station. The rapid pace of technology means that the scientific instruments utilized on space missions gather larger chunks of data than their predecessors. But the increasingly high-quality information continues to be bottle-necked by the radio frequency transmissions that convey it to Earth. Many of the existing deep space missions send back 200 to 400 kilobits of information per second. OPALS will send information by laser beam rather than radio wave, demonstrating a speed of up to 50 megabits per second. Future deep space optical communication systems should reach up to one gigabit per second. "Imagine trying to download a movie at home over dial-up," Oaida said. "It's essentially the same problem in space, whether we're talking about low-Earth orbit or deep space." Upgrading from radio to optical communications will be "like upgrading from dial-up to DSL," Oaida added. After its launch Sunday, OPALS will be positioned by robotic arm on the station's exterior. Over a period of almost three months, a telescope on the ground will track the instrument and conduct a number of transmission tests. When a laser from the ground-based telescope hits the uplink beacon on OPALS, the instrument will downlink a modulated laser beam with a formatted video. The tests will study the pointing, accuracy, and tracking of the very tightly focused laser beam. Scientists will also study the characteristics of optical links through the planet's atmosphere, as well as training and educating NASA personnel in the operation of optical communication systems. The communications system relies primarily on commercial off-the-shelf hardware enclosed in a pressurized container, an approach that allowed for a lower-cost development on an efficient schedule. Scientists beamed images of the Mona Lisa by laser to NASA's Lunar Reconnaissance Orbiter in 2013, making it the first optically transmitted data sent over planetary distances. The technology was conceived, constructed, and tested at NASA's Jet Propulsion Laboratory in Pasadena, Calif., by engineers working through the lab's Phaeton early-career-hire program.